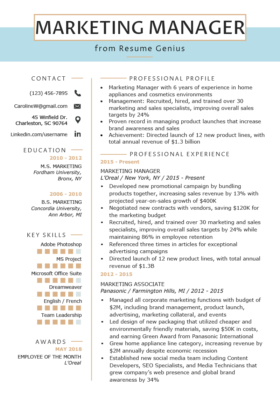 Need help perfecting your marketing resume? 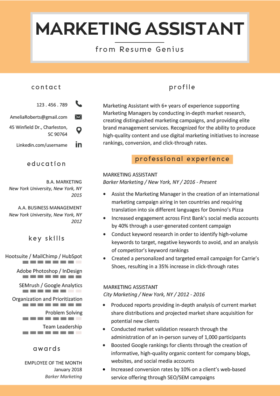 Just download our Marketing Professional resume sample, or check out our related marketing resumes to get started. If you want to save time, use our fast and easy resume builder! An organized and creative professional with proven marketing skills and a desire to learn more. Possess 6+ years of experience working for a diverse group of organizations and clients. Gained expertise in data analysis, publication marketing, and web-based advertising. Looking to utilize my existing skill set to increase company profitability. Marketing is a broad category encompassing every industry. It simply means communicating to customers the value of your product or service, in hopes that they’ll purchase it. Want more? Enhance your resume with our endless list of action verbs. Your value as a marketer is measured by how much you increase sales, brand awareness, customer interest, and satisfaction. 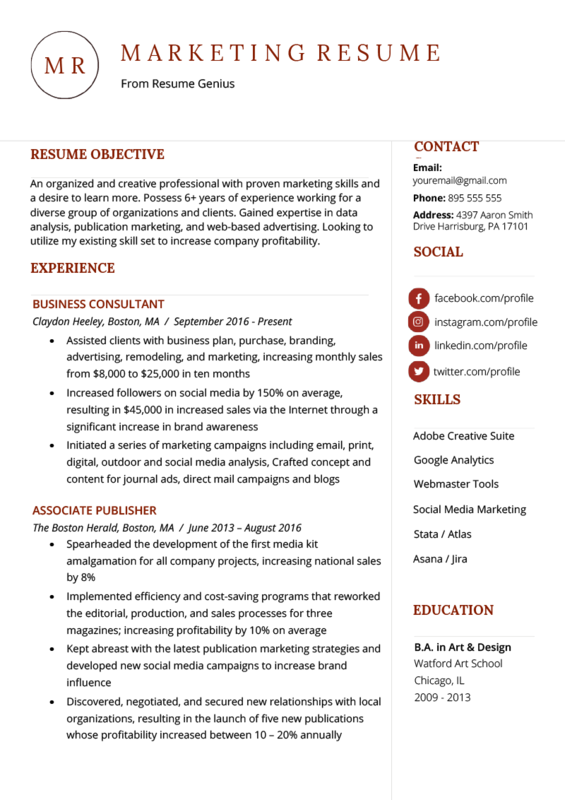 Need help formatting your resume? Download these customizable resumes. When writing your resume, don’t simply tell the hiring manager that you were in charge of campaigns to increase brand awareness, initiate relationships with new clients, or increase followers on social media. Be sure to describe, with numbers, how your effort increased profits, social media followers, brand awareness, etc. In this example, the candidate emphasizes his/her ability to take on a full-scale marketing project (including planning, development, and execution) and succeed. Because this is the most impressive and relevant bullet point, he/she put it in the first position. If you can put a number to your social media efforts, your resume will stand out in comparison to others. Marketing in the 21st century requires intimate knowledge of social media platforms. Increasing followers means greater brand awareness, potential sales, discussion, and interest. If you can put a number to your social media efforts, your resume will stand out in comparison to others. Oftentimes, profits and savings can be created via efficiency efforts. Be sure to include this information in your resume, too. This is the key to earning industry level salaries. Actually, this resume has more than just three examples of quantified information, making it impactful and convincing to a hiring manager. Take the time to see how and where this candidate quantified his/her resume, and try to emulate it yourself. Successful marketers know how to use various piece of software to create content, manage social media, and analyze customer data in order to create high quality, targeted campaigns at potential customers. Marketing is a multi-faceted profession, with high levels of education, and a competitive applicant pool. Marketing can be lucrative if you rise high enough. Many companies now use an Applicant Tracking System (ATS), which is software that can literally read your resume and determine if your experience is relevant enough to be sent to the hiring manager. It does this by tracking the number of keywords and key phrases on your resume related to any potential job. One way that you can avoid being rejected by the ATS robot (and totally beat the software) is to list your skills (both acronyms and spelled out) in the Skills section of your resume. Not only will it help you pass the ATS, it will also give the hiring manager potential questions to ask you during an interview about your familiarity with those tools. Marketing is one of the most diverse professional industries in existence and most companies rarely just hire “a marketer”. Instead, companies will be looking for more specific expertise and marketing specialists. This means you will have to tailor your resume and experiences to match the job description provided. The specific educational experiences and skills desired by employers are expressed below and come from a study done by Jay Ivey of Software Advice. If you have a Bachelor’s in Marketing but want to diversify your skillset to open up more employment opportunities you should consider pursuing some continued education. Below are just 3 potential avenues for certificate programs that will make you a more attractive marketing applicant. Udemy offers a wide range of online courses across multiple industries. One core tenant of marketing is quality content, whether it be print, video, audio or online. Now more than ever the ability to effectively market content is a necessity for millennial job hunters. Most large marketing oriented universities and business schools offer more micro-oriented marketing classes. With the rise of online and mobile media consumption digital marketing skills are in high demand. Very reputable schools such as the NYU School of Professional Studies offers individual Digital Marketing courses that would be a great boost to any resume. Most Millennials will have social media knowledge, but acquiring specific social media marketing knowledge is a great way to make yourself a more flexible and thus higher value addition to almost any company, given the importance of social media in the 21st century. Again, very reputable schools, such as Georgetown’s School of Continuing Studies offer social media marketing courses that can be taken individually to help build a stronger overall resume. Marketing is one of those industries that because of its technical nature and connection with current, popular culture requires constant education and expansion of skill sets. The tables provided by Software Advice clearly show that both skill sets and experience being sought in MOST marketing job postings are very diverse in nature. Expressing your wide variety of marketing skills should be down throughout your resume. From the beginning in your Career Objective all the way through to your Educational Section, your marketing resume should be saturated the above-mentioned skills.